Wich one should I use to test OC? Personally While Cinebench is not the perfect indicator, usually firing up a multi score run with R15 and now R20 will fall over pretty quickly if not stable is a quick indicator. If it passes, then I move on to more complex tests. Usually I will use a combination of AIDA 64 and ASUS realbench. 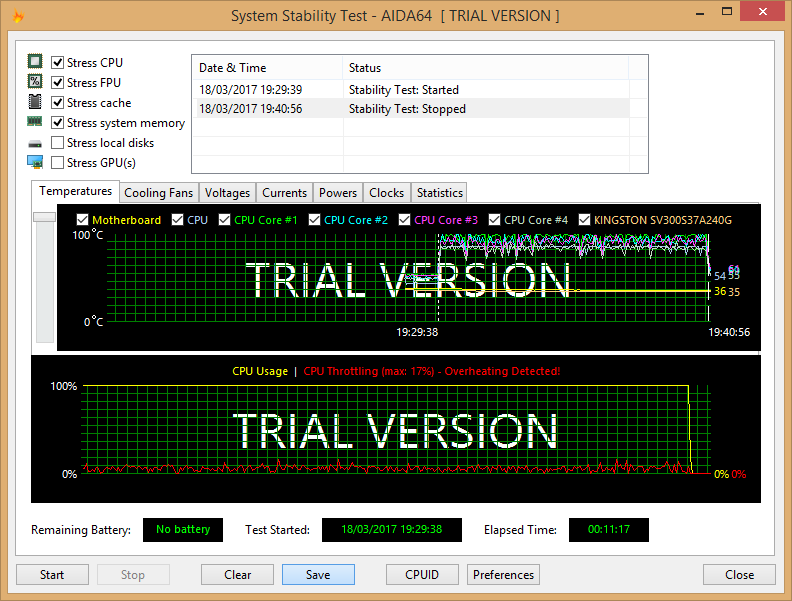 I use AIDA64 for stress tests to check stability and also monitor temps while overclocking. Cinebench is only a benchmark. AIDA64 can run for hours to ensure stability with the overclock. Prime95 can stress test too but you will need a seperate program to monitor temps live. As for setting the overclock I would prefer to do so in the bios rather than using a program to do so. I know AMD has a ryzen specific one and some motherboards have a an OC utility program as well for setting the overclock. This. IMO, Prime95 small FFT will show instability if it exist. I run Prime95 small FTT for 3hrs to be sure. Others will suggest running Prime95 for 24hrs, but I believe that's unnecessarily long and potentially harmful to the CPU. Personally, I run a combination of several hours of different Prime95 test and several hours of Aida64 test before considering it stable. To answer your question; I have both Cinebench benchmarks. Both ramp up the CPU but aren't stress test. Because R20 is so new you can't find a lot of benchmarks or comparisons yet, but that will change with time. Use both... they're free. So cinbench is not good to test OC? Not really. It will only show how well the CPU performs with a score. If your overclock is not fully stable it could take a hour or 2 to fail or even longer and cinebench simply does not run that long. Also cinebench doesn't show CPU temps. Now if your CPU reaches its max temps it can thermal throttle and this is how it would look in AIDA64. The goal of using AIDA64 is to see if it can stay running on stress for hours (I let mine run overnight to ensure 100% stability) and the CPU temps stay within reason then the overclock is good. The max temp I like to aim for is ~80c but thermal throttle is 100c. On air coolers 10 or so minutes is good to reach its max temps while liquid cooling can take over 30 minutes to hit its max temp so you need to keep an eye on temps during that time. I'm planning on using ryzen master for temps, is AIDA64 enough or should i also run prime 95? Either or. Just need to be able to stress the CPU to max load for extended periods of time and monitor temps at the same time. Cinebench is a benchmark utility to determine the strength of a CPU, a tool like AIDA64 would be better for testing stability. Cinebench isn't great but tends to crash out if you have a unstable overclock so it is often used as a quick and dirty but imperfect indicator. R20 being far harsher on the CPU is better for this. I run a sustained 8+hour Realbench run when I overclock since I've found to many cases of CPU able to take a sustained load like Prime95 or AIDA64 that would crash under a dynamic load like gaming or Realbench. 1.4v is currently the max or so the reviewers are referencing from the press material AMD sampled them. Preferably under 1.35v as that is considered "Everyday use safe"